Woodforest National Bank is based in Houston, Texas and is currently the largest corporate partner of Walmart, with branches located in most Walmart and Sam’s Club stores, as well as many Kroger supermarkets. They offer generous second-chance banking for customers with problematic credit, and online reviews for Woodforest are mixed but generally favorable. The services they offer include online banking, mobile banking, overdraft protection, investment services, retirement plans, personal financial planning and corporate benefits for employees. Their card services include MasterCard debit services, fraud protection, Visa Bonus Rewards cards, Platinum cards and secured credit cards. Like other major banks, Woodforest offers investment services, such as money market accounts, certificates of deposit, savings accounts, rewards checking accounts, retirement plans, 401K savings for employees, payment benefits for business executives and personal financial planning. Since Woodforest is privately held rather than publicly traded, they aren’t as large as banks such as Wells Fargo or Chase, but their financial planning services are available for anyone who walks into a branch. When it comes to card services, Woodforest offers zero-liability protection against unauthorized use of debit and credit cards as well as 24-hour fraud monitoring. 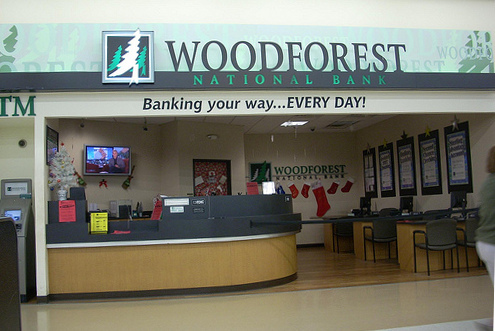 These services are also generally offered by larger corporate competitors of Woodforest, but depending on the time of year, the smaller bank may offer better interest rates on credit cards, savings accounts, CDs or money market accounts. Many Woodforest customers open second-chance checking accounts due to credit problems. There is a monthly fee to have one of these provisional accounts, and they can help reestablish credit after several months of on-time bill payment. Ordering paper checks costs an additional fee, and checking accounts must have at least $100 in them to avoid a service charge. Woodforest’s second-chance banking has higher surcharges and a longer period of probation than competing banks that also offer this service, such as PNC Bank. Online and mobile banking are included with every account, and customers who sign up for new Woodforest accounts receive a link to their online accounts in a welcome email. Registering for an online bank account requires a checking account, credit or debit card number, the customer’s mother’s maiden name and the customer’s birth date. The Woodforest mobile app connects customers to the same secure banking portal as the website and provides 24-hour access to account information as well as transfers between accounts. These services are standard for most banks, and Woodforest customers report that they don’t usually have problems using the online banking services. However, many customers report that deposits sometimes take a long time to go through and that Woodforest employees are not always helpful when resolving problems. Woodforest is headquartered in Houston, Texas, and branches are located throughout 17 states, including Texas, West Virginia, Virginia, Alabama, Florida, Kentucky, Georgia, Indiana, Illinois, Louisiana, Mississippi, Maryland, North Carolina, New York, Pennsylvania, Ohio and South Carolina. There are 788 locations in total, and several branches are open 24 hours a day and only closed on Christmas. Most Walmart stores in the above-mentioned states have Woodforest branches, and Kroger stores in major cities in these states also have them. Banking hours vary between locations, and aside from the 24-hour branches, most Woodforest locations are open from 9 am to 5 pm, Monday through Friday. Branches that are open on Saturday close at 2 pm. To find out the business hours of the nearest Woodforest branch, use the branch locator on the website. The main phone number of their headquarters is 832-375-2000, and their central toll-free number is 1-877-968-7962. The toll-free number is open 24 hours a day, but most services are only available during banking hours. The bottom line about using Woodforest is that it’s a convenient bank for Walmart shoppers and a pretty good service for customers with poor credit. Checking account holders should make sure they always have $100 in their accounts, and customers should allow ample time for deposits to become available.